Indonesians have started voting to choose their next president. Voting got underway in the presidential and legislative elections at 7am on Wednesday (2300 GMT Tuesday) in easternmost provinces. It began in the capital Jakarta two hours later. Indonesia has three time zones. Voting ends at 1pm and so-called “quick count” results are expected after about two hours. 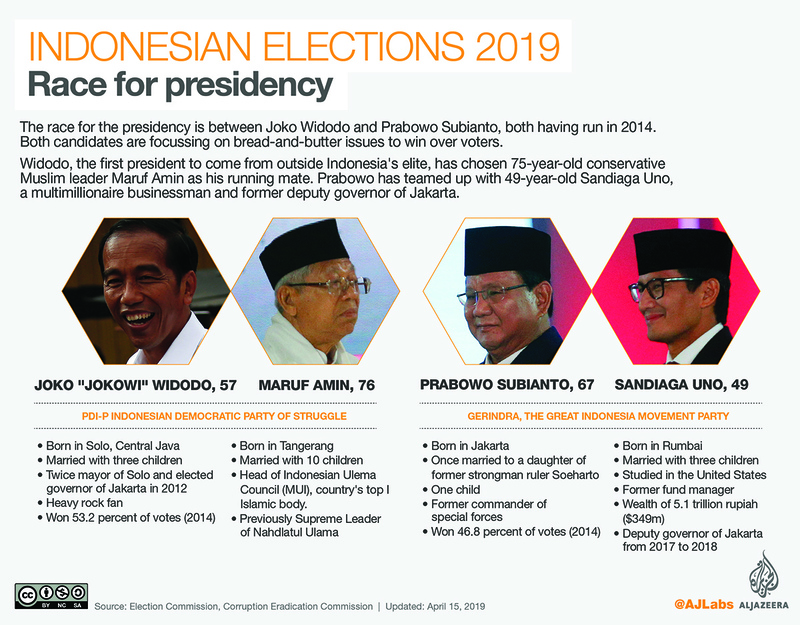 The presidential race pits incumbent Joko “Jokowi” Widodo and his running mate, Indonesian Ulama Council Chairman Ma’ruf Amin, against retired general and longtime rival Prabowo Subianto and multi-millionaire businessman Sandiaga Uno. Widodo and Amin are trying to project themselves as progressive yet religious, with a campaign slogan of “Advancing Indonesia”. Prabowo, who has been accused of human rights abuses, ran against Widodo in 2014, while Uno is a businessman who spent a few months as deputy governor of Jakarta, after the mass rallies against Basuki Tjajaha Purnama (also known as Ahok) who was accused – and later convicted – of blasphemy. Ballot papers were delivered with security escorts to remote regions of the country by plane, speedboat, canoe and horseback. Two speedboats have been deployed as mobile polling stations for residents on the Thousand Islands chain north of Jakarta. Al Jazeera’s Wayne Hay, reporting from Jakarta, said the turnout was likely to be more than the traditional 70 percent. The latest opinion polls in the lead-up to the election had Widodo-Amin leading by as many as 20 points, with a significant proportion of undecided voters. Most political experts predict a closer result, however, given that 2014’s pre-election polls were similar, but Widodo ultimately beat Prabowo by just six points. Wednesday will also see elections for parliamentarians taking place. Legislative elections are normally held months prior to presidential elections but the move means voters will be confronted with a list of tough choices. Last week, several videos appeared online apparently showing thousands of voting papers stuffed in bags at a warehouse in neighbouring Malaysia, with many apparently already marked. 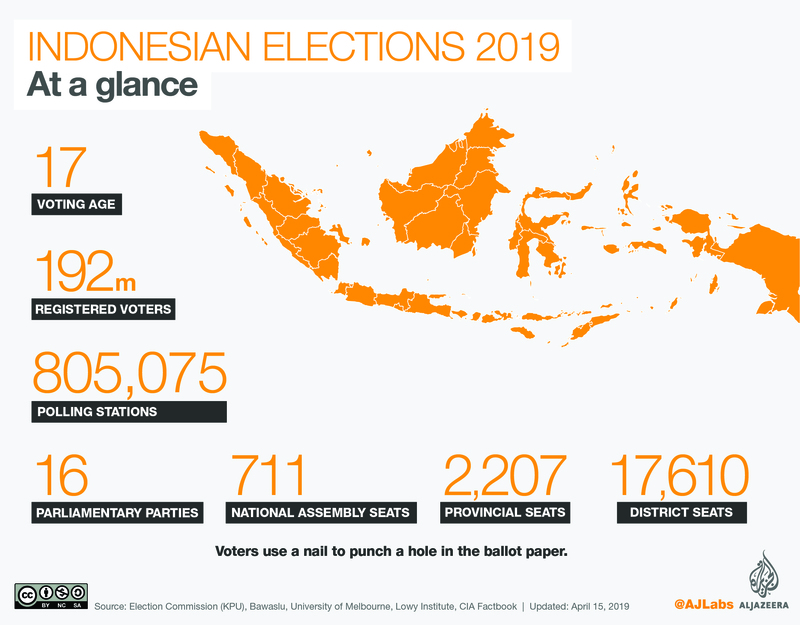 The country’s election supervisory board has recommended a re-vote for Indonesians in Malaysia and in Australia, where several hundred registered voters were still standing in line after the polls closed there on Saturday.